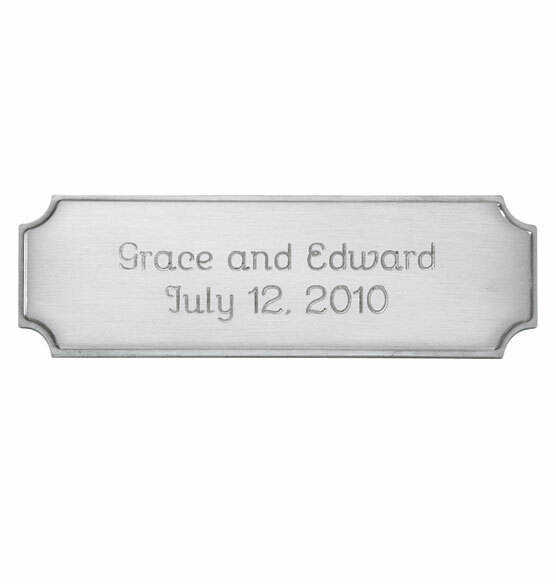 Silver plaque can be engraved up to 3 lines, 25 characters/spaces per line. Adhesive back. Can also be ordered for albums you already own. 1" high x 3" wide. The space on the album was not large enough for long name and location. All information fit nicely on this plaque. The nameplate makes the lovely container a special gift for a new baby. 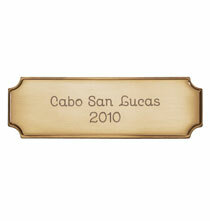 I have ordered these plaques for the albums that I use for my grandchildren. To add to a photo plaque. This plaque will go on the front of my grandson's baby book. I put this on the memory box to personalize it with the baby's statistics. This silver plaque is perfect for small leather albums that do not have a place to state what the photos inside the album are about or when they were taken. I have purchased at least a dozen of these in the past for my photo albums and they are fabulous! Have never had them come off after years of use! Very eye catching. Highly recommend! Clean lines, simple and classy. what size is this plaque?